Ameyokocho, or Ameyoko for short is a major shopping area of Ueno. It’s literally translated as “Candy Alley” or “American Alley” depending on how you read it. “Ame” is short for sweet or America and “Cho” can be translated as town, or alley. This area was famous as a black market area for American products after WWII. However, this area has changed significantly since then. Today, this area is more popular for its small shops and cheap prices. 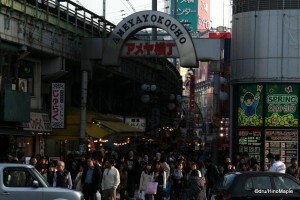 Ameyoko is located south of Ueno Station. Immediately, you will be faced with a wall of buildings with the train tracks running right through them. Next to the highway is a large department store, Marui, and next to that is a somewhat large toy shop, Yamashiroya. Marui is a typical department store, and Yamashiroya is one of the best toy shops outside of Akihabara. It’s also difficult to navigate as the floors are packed with good from floor to ceiling. On the west side of the tracks, you will see Yodobashi Camera. While this is a famous electronics goods shop, it’s not as good as their Akihabara branch. This branch should only be visited if you have nothing better to do. In the area just inside Ameyoko, you’ll find several small restaurants selling various typical Japanese foods. You can buy everything from yakitori to sushi. A good tip is to head south for about one block. From here, you can see a few cheap sushi shops under the train tracks. If you are on the west side of the tracks, next to Yodobashi Camera, you will be in the fresh market area. Here, they will offer a variety of seafood, konbu, and other items needed to make a delicious dinner. Do note that they are open at different times of the day, probably the afternoon. If you see them, you will see, or rather hear, the fishermen selling their wares for a very cheap and reasonable price. The only problem is that they tend to sell in larger quantities making it difficult to purchase seafood for just one or two people. In the same area, they have a famous chocolate shop where everything is just 1000 Yen. Basically, you can just walk up and they’ll throw a lot of chocolate into an average sized grocery bag, and it all costs only 1000 yen. You never really know how much, or what you will get, but that’s part of the adventure. Located somewhere under the tracks, you’ll be able to see a man selling “Ueno Okonomiyaki” and possibly another man selling mochi. These two stands are great for trying Japanese junk food. It’s not too expensive, but not cheap either. Closer to the south end of Ameyoko, on the east side, there is a supermarket called Nikki. This is one of the most famous shops in the area. 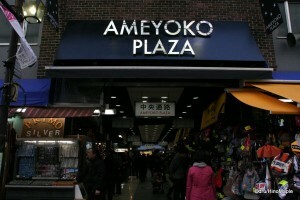 The shop itself is large, by Ameyoko standards, and they sell a variety of foods. It’s not a traditional Japanese supermarket. You can find various name brand snacks, along with western snacks. If you are craving western chocolate bars, you can usually find the most famous ones here. Don’t expect to find “Oh Henry!” or “Reese’s Pieces” around here though; just the standard Hershey’s Kisses. The good thing is that you can get Japanese snacks such as sembe or dried seafood for a decent price. One of the entrances to the shopping plaza under the JR tracks. Food is not the only famous thing to shop for in Ameyoko. There are several shops selling everything you can imagine. Walking under the train tracks will allow you to see a market that is more akin to a Chinese style market. The shops are very small, and they sell things such as leather jackets/bags, jewelry, make-up, and perfume. At the end of Ameyoko, in the south, they have all of the perfume and make-up shops. Towards the north end, you will see more clothing shops. Scattered throughout the entire area, mostly on the west side of the tracks, you will see similar shops. Some of the biggest things you can buy are shoes. There several shoe shops with a large variety. After walking around for a bit, you will start to notice that most of the shops sell similar items, with the only difference being colours. While Harajuku may have the most variety, Ueno still has a good selection, and it’s usually at a cheaper price. If higher end goods are what you are looking for, be sure to head to Matsuzakaya, which is just south of Ameyoko. It’s your typical high end department store. If you don’t want to go to Ginza, this is probably the best place to go, if you are in Ueno. Ameyoko is a great place to visit. The atmosphere alone is worth the trip. You can experience a typical Asian street market, without worrying about buying something of poor quality. Japan prides itself on quality, and this area is no exception. Do beware that sometimes you can get poor quality goods, but most of the shops are legitimate now. You generally don’t have to worry too much. It’s also a great way to spend a morning, or afternoon. It’s very close to Akihabara, which is about 10 minutes from the southern point of Akihabara. The walk itself isn’t very interesting, but you can always save a few bucks. This is part of my series on Ueno. Please continue to read more about Ueno at Ueno – Corin Street, Tokyo Bike Town and Ueno – Ueno Park. 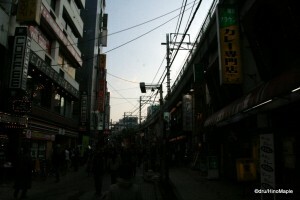 This entry was posted in Tokyo and tagged ame, American Alley, American town, Ameyoko, Ameyokocho, asian market, black market, candy alley, Candy town, cho, department store, gray market, grey market, japan, market, Nikki, Okonomiyaki, sushi, sweet, Taito, Taito-ku, tokyo, Tokyo-to, Ueno, yakitori, Yamashiroya, Yodobashi Camera, お好み焼き, アメ, アメ横, ニッキ, 上野, 台東, 台東区, 日本, 東京, 東京都, 鮨 by Dru. Bookmark the permalink. I agree. I also like your blog post. Thanks for the comment. I love Ameyoko! It’s especially lekker to visit in summer, when there are so many tables in the streets. I think it is fun, but sometimes there are too many people there. Yushima is fun too, but I would return to the train tracks to see the art mall, or craft mall near Suehirocho.